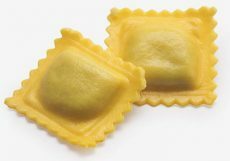 Pumpkin ravioli: an important pumpkin filling; what about with amaretti or mustard? We have created this stuffing after trying and finding the perfect balance for a sweet organic pumpkin to lead the point of envying the traditional Mantuan recipe. Store chilled at a temperature not higher than + 4 ° C.
50 days at controlled temperature.